Digimon: System Restore: Data Squad Episode 47: The Data Squad's Final Battle! Data Squad Episode 47: The Data Squad's Final Battle! In this episode, the battle to save humanity turns into an outright revolt against the monarchy. The whole Spencer masquerade had an additional purpose beyond all the grief it caused Marcus- it disguised King Drasil's final form to the point that him having one didn't seem tacked on the way Lucemon Shadowlord Mode or the various incarnations of Myotismon did. We learn a little too much about King Drasil, and it doesn't always fit in with his character, but his stubborn insistence on destroying the human world requires a great stand from all sides. That response is impressive, especially as it becomes more about the Digimon than the humans that are being threatened. Nobody should be surprised that the initial attack is a failure, or that King Drasil is diabolical in his methods. Data Squad giving a dramatic speech about how they'll never give up? Fine, head to the human world and beat up Garudamon instead. His invincibility, even against an awesome quadruple-tech attack from four Burst Mode Digimon, is also to be expected. It's all in the presentation here, particularly the way King Drasil fights dirty, launching a bigass death crystal at the humans or a massive wave at the human world while fighting the Digimon. 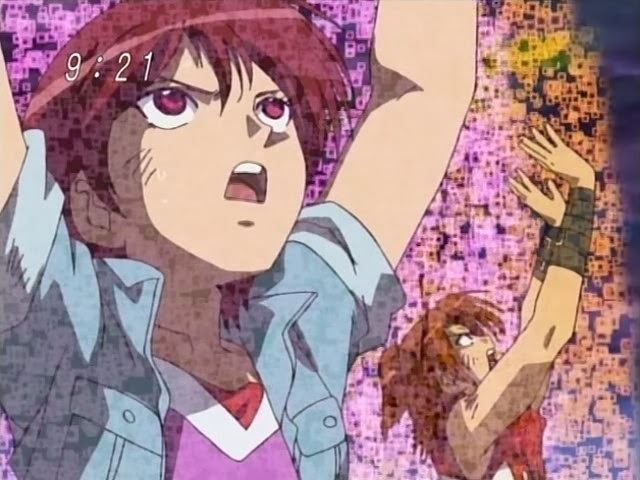 When it comes down to it, King Drasil's big argument is that he's carrying out the will of the Digimon, collectively seeking revenge for Kurata's invasion. 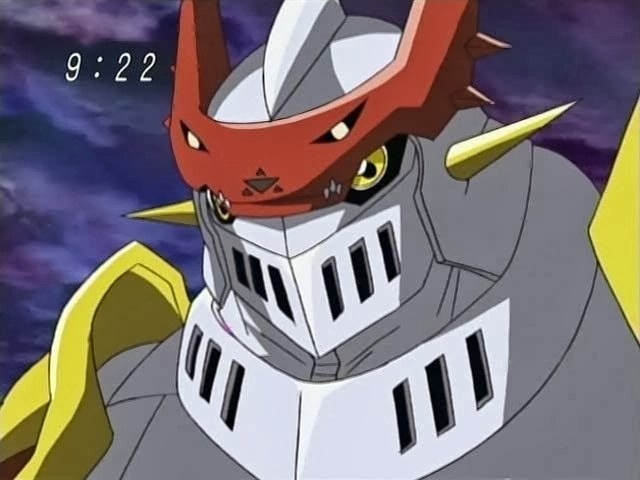 For all the Data Squad do to fight back, and their massive DNA Charges to support Craniumon are plenty, it's the Digimon who need to prove him wrong. 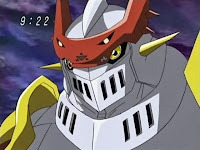 The sampling of Digimon who come to humanity's aid might be a little skewed as most would have some connection to DATS, but it's still impressive, especially when it includes stragglers like Gotsumon and Biyomon's charges. It's also enough for the remaining Royal Knights. Craniumon and the Digimon are putting themselves at great risk to prevent the worlds colliding. They're doing it the hard way, the way that doesn't involve just getting rid of the obstruction. It's a shame that it takes a bunch of commoners (and, we should hope, enough innocent human faces that the knights surely have had to see) to show them the light, but they see it and suddenly ask all the questions that they've likely had this whole time. Gallantmon returns from his ice-breaker with Kudamon, convinced that they have no reason to accept King Drasil as the ultimate authority. Good on them... it's about damn time. The whole thing about King Drasil being a computer, however, is a little much. It's propped up as a major revelation, and should go far to explain his relentless effort at eradicating mankind and his dissimilarity to the Digimon he reigns over. Surely there are comparisons to be drawn to D-Reaper and its similar pursuits. But while D-Reaper was established early into the final arc of Tamers, King Drasil being a computer is offered more to rationalize an existing character. All it does, however, is raise more questions. King Drasil's true nature only explains his refusal to undo his decree that the human world be destroyed. Arguably, his refusal to intervene to stop Kurata could be seen as interfering with the experiment. But how did this computer gain such an influence over the Royal Knights, especially if it took a stance of not actually doing anything? Also, D-Reaper was so imposing due to its lack of emotion, seeing it as a human weakness and treating it as such. King Drasil is petty and vengeful, leading him to irrational/irrelevant actions like taking Spencer's body. No computer would stoop to this. So it's hard to figure out this route. 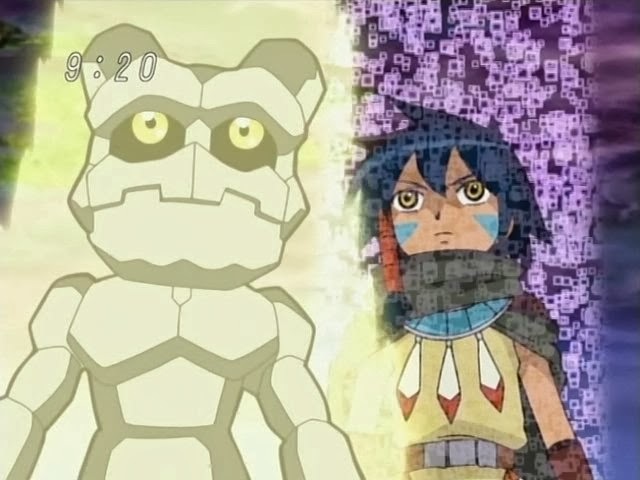 Are we supposed to believe that only a heartless computer could eliminate all Digimon? King Drasil was sure cool with it in X-Evolution. Sure he'd give it another go. Once again, the GeoGreySword is completely useless. I don't think that thing's been productive since fighting Kouki. It's easy enough to accept that Gotsumon is more tolerant towards humans in this go-round, as he didn't witness Kurata's first devastation. But why is he so timid? In his last life, he was insane, but he never backed down from a fight. Now he wants no part in anything. Yoshi and Marcus both sneak their catchphrases into this episode. I'm not a big fan of trying to get Yoshi's in there, since she's been calling everything the worst since the beginning of the show and doesn't seem to change her tone once it actually is. The first Gotsumon was really an Ultimate pretending to be a Rookie (for some reason? ), this one likely is a Rookie given how little time has passed and the lack of a human partner to boost his strength. Fusion Episode 01: Mikey Goes To Another World!